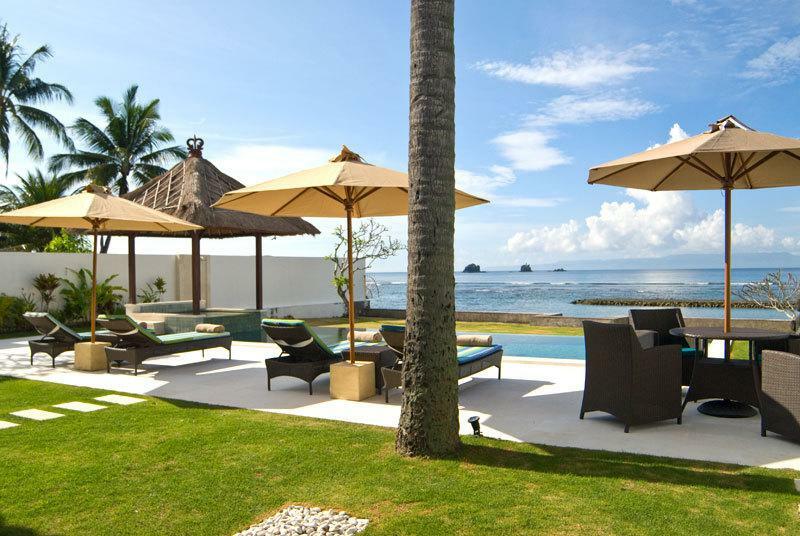 Villa 3570 is a stunning three bedroom ocean-front villa in Candidasa, Bali with spectacular views of the Lombok Strait. 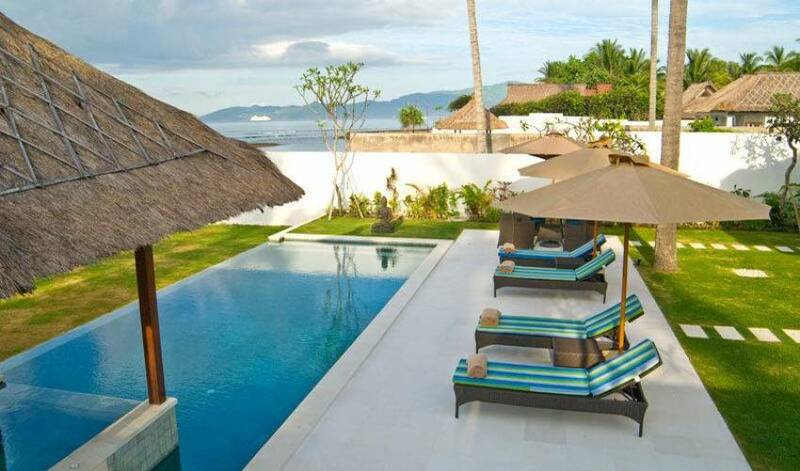 This Candidasa villa blends traditional Balinese architecture with a contemporary style and comprises three self-contained bedroom suites with en suite bathrooms at ground-level. 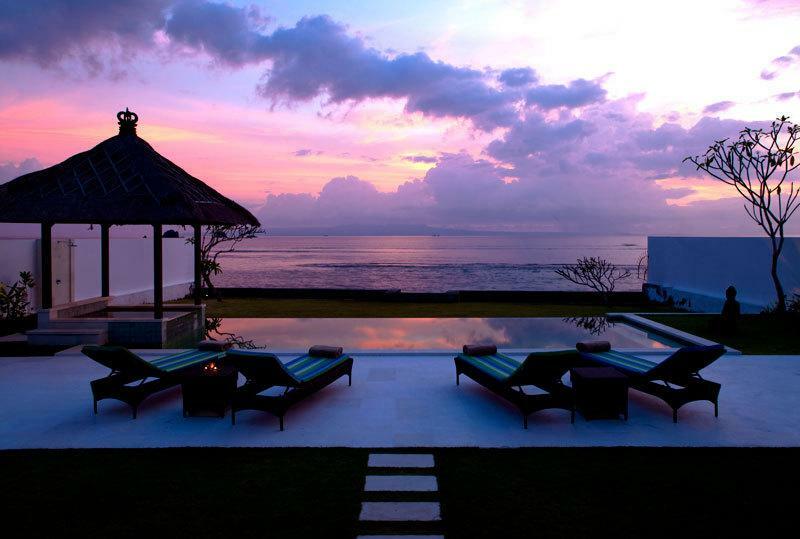 This luxury villa resort boasts a shimmering private infinity pool with an outdoor Jacuzzi with breathtaking ocean views from every room with a backdrop of the islands of Nusa Penida, Nusa Lembongan and Lombok. 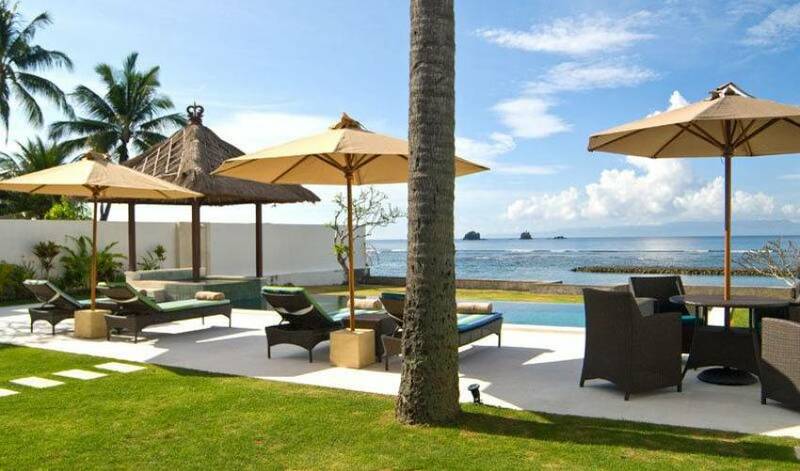 The charming resort rests upon 900m2 of prime ocean front property in Candidasa, Bali. 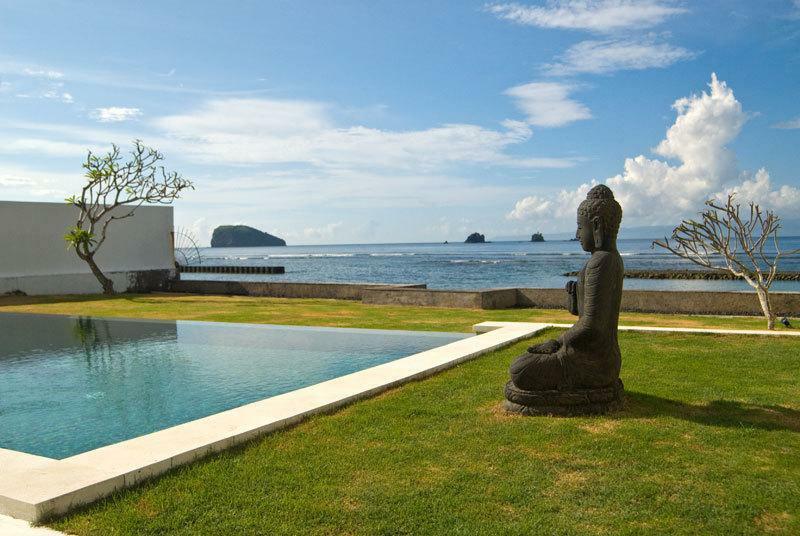 It is literally just steps away from the ocean where a reef offers superb snorkeling. 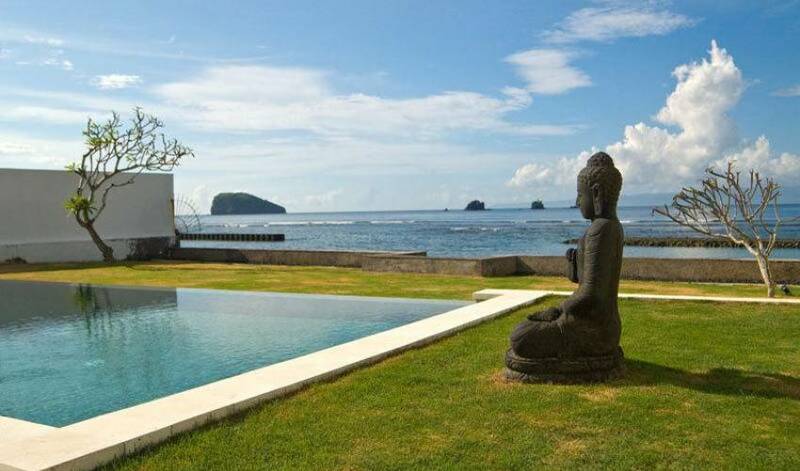 The villa is positioned about a hundred metres in from the main road, and is accessed via a private driveway protecting the calm serenity of the location. It has its own secure entrance with a parking area large enough for two vehicles. 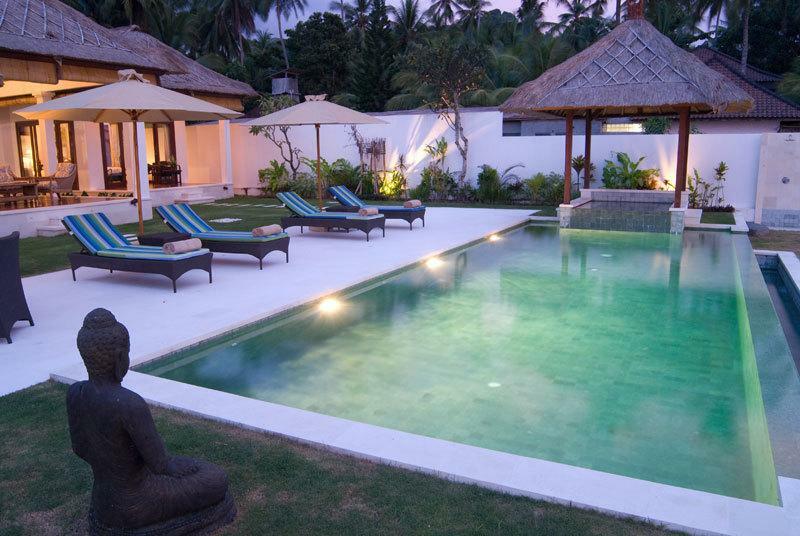 It is currently under the management of Kalyana Bay Villas, Manggis. 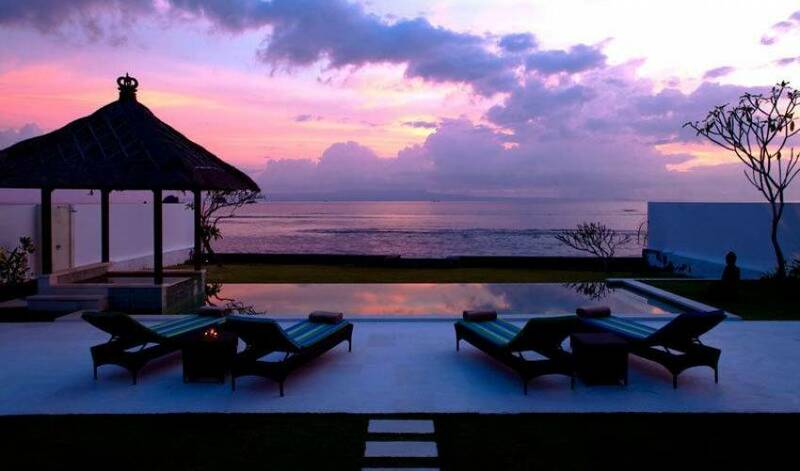 One of the best luxury resorts in its class in Bali, the villa is located on Jl. 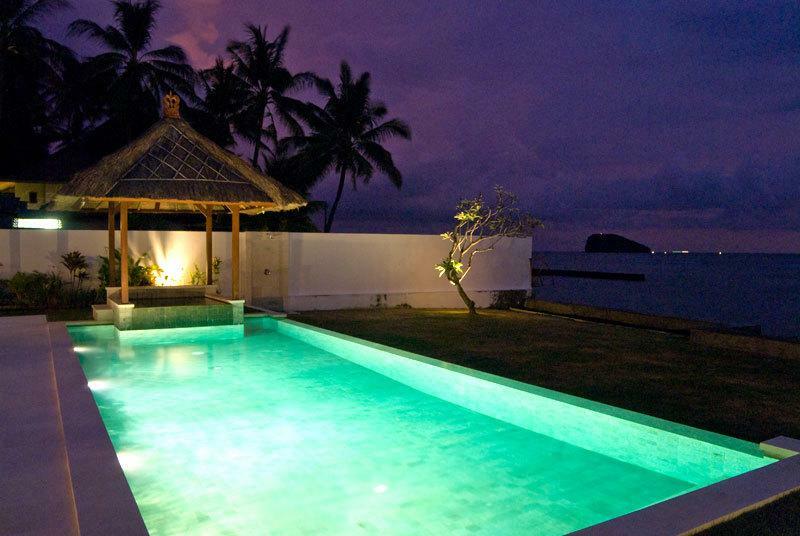 Raya Candidasa in the heart of the delightful seaside village of Candidasa. 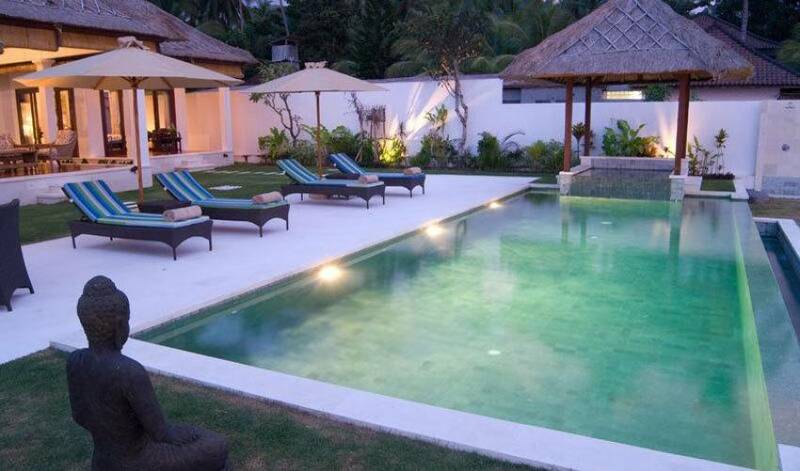 It is just over an hour´s drive from Bali International Airport when traffic conditions are good, 15 minutes from the ferry port at Padang Bai, half an hour from the Taman Safari Park, and about 40 minutes from Ubud. The main living & dining area is located in an expansive, open-plan area which provides glorious vistas making it an ideal space for formal and informal get-togethers. 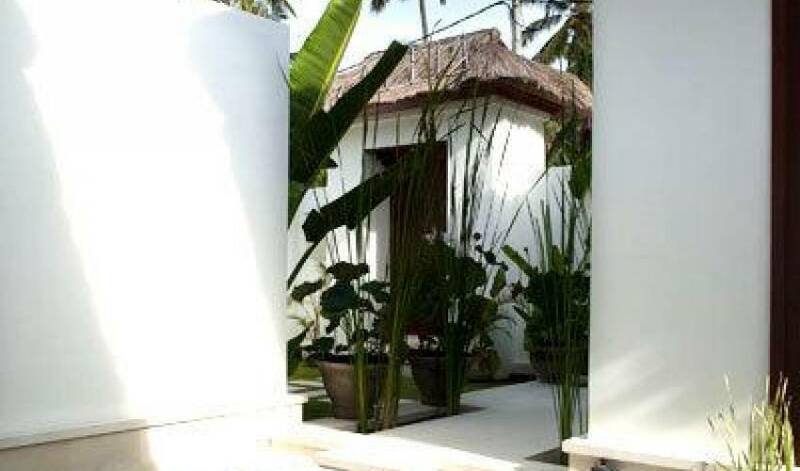 The length of the area can be covered with bamboo blinds if required adding to the charm of the local decor. The dining area is furnished with a glass-topped table for eight. The room is cooled by ceiling fans and gentle sea breezes with lots of cross ventilation. A music system is provided for guests´ entertainment. The living/dining area is connected to the fully-equipped kitchen (to the left side of the Abhimanyu suite) and a bar area for the use of guests. A separate washroom is positioned to one side of the kitchen. The kitchen features a beige marble countertop all along the walls, and is fully equipped with a refrigerator, an electric oven, a cooking gas range, microwave, juicer, toaster, pots and pans, full sets of cutlery, crockery, and glassware. The utility area comprises a washing machine and dryer. A storage room is next to the utility area which can serve as a room for the maid/nanny for visiting guests if required. 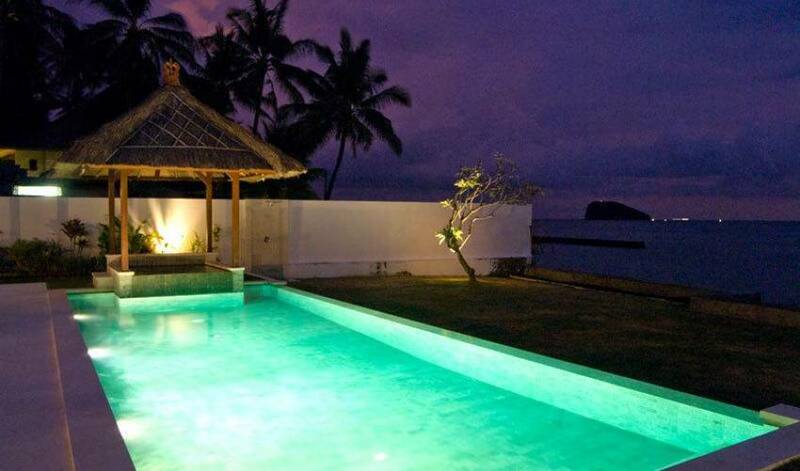 The contemporary-styled villa comprises three single-storey buildings at ground level. 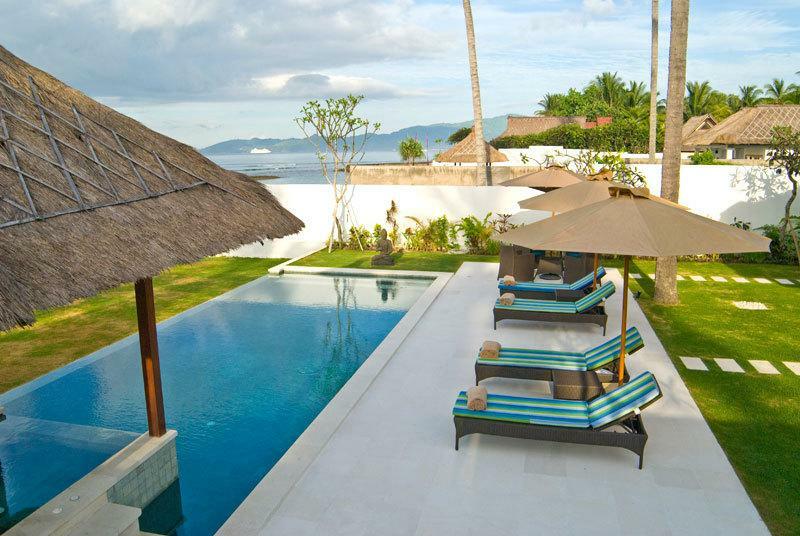 The architecture combines contemporary elements with traditional Balinese features. The villa, with open plan living/dining areas is characterized by an abundance of space and light, elegance and graceful simplicity. 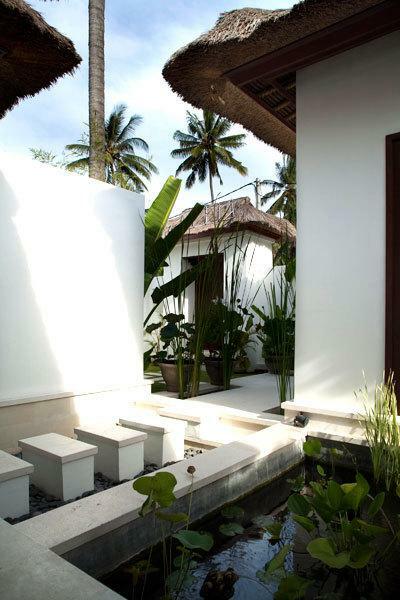 The master suite, Abhimanyu, located in the center of the villa and opens out to the living/dining area through an elegant walkway edged with lotus and melati ponds that are also home to sparkling goldfish. The suite to the right (facing the ocean) is the Arjuna Suite and to the left is the Draupadi Suite. The Arjuna and Draupadi suites have porticos that afford lovely views of the ocean and are ideal for a morning coffee or an evening cocktail. All three bedroom suites are spacious, well-lit, fully air-conditioned, with king-sized beds. They are furnished with an armchair, elegant side tables, and table lamps. Each bedroom suite is equipped with flat-screen TV and DVD player. Wireless internet is available (at a charge) throughout the villa. The Master Suite Abhimanyu is also equipped with cable TV and comes with an additional desk and chair. All bedrooms have gleaming timber floors, and are equipped with safe deposit boxes. Rollaway beds are also available on request. There is a fully equipped kitchen and laundry facilities (washer and dryer) are available on-site. All suites are tastefully furnished with subtle and elegant artwork. Each suite has a dressing area with a walk in wardrobe with ample storage space and drawers. Sliding glass doors in each bedroom provide direct access to the living/dining area, which is positioned centrally between the three suites. All the en-suite bathrooms are fashioned in cream palimanan stone and beige marble with oversize terrazzo bathtubs and well-lit double vanity units complete with wall mirrors and twin washbasins. Toilets and raindrop showers are positioned in separate cubicles. Every bathroom has luxury toiletries from Spafactory and Sensatia.